The story opens on August 7th 1786, when William Pancoust Odell was born to Thomas and Elizabeth. Two of William’s ten children, John and James, moved away from the family’s traditional way of life as farmers and they founded the business, which still exists today. John, who was born in 1818, joined Thomas French as his assistant at the Newport Pagnell ironmongery and blacksmith’s shop with the tin and copper smiths and forges. John learned the trade and worked his way up to the point in 1850 he eventually bought out the business. When younger brother James, who was born in 1835, came of age to take an apprenticeship, the business was well and truly in the blood. However, there was no opening for him in Newport Pagnell. The problem was that John’s own sons were already learning the ropes of the business ready to take over in the future. So James took himself off to London to find an apprenticeship in the ironmongery trade. Subsequently, he went on to a foundry in Banbury. In 1863, fully trained, he returned to the area and bought an ironmonger’s shop in Stony Stratford, where there is evidence that an ironmongers had been in existence as far back as 1421. At Newport Pagnell the shop passed from John to his son John and then to his three sons Cecil, Reginald and Percy. Unfortunately, when the First World War broke out, Percy and Reginald went off to fight and Percy was killed in action in 1916. Percy was remembered by the men he fought with and the officers as a hero and a very caring, special man. He was consequently awarded the military medal and there is a plaque commemorating his memory and courage in the local church of St. Peter and St. Paul in Newport Pagnell. After the death of Percy’s father John in 1935, Reginald and Cecil took control of the business and it was renamed Odell Brothers. During the war and for a time afterwards the business made slow progress. It didn’t make Reginald and Cecil rich, but Mr.Reg and Mr. Cecil, as they were fondly called, were certainly something of local folklore. For instance one story goes that on a hot summer’s day a passing motorist stopped at the shop to ask for water to revive wilting flowers in the car. Without hesitation Mr. Reg said, “Why certainly Madam – do you require hard or soft water? The Odell’s were all active members of local society as was their sister Dorothy. Cecil’s son and daughter chose not to join the family business and went their own ways for employment. In 1970 Cecil died at the age of 85 leaving Reg to maintain the business until his last days. He died in 1976 just before his 94th birthday. His nephew Jack, his only direct descendent, worked in Fleet Street at this time. He decided to juggle both his work in London and the shop and against all odds kept the business going. However the crunch came and he decided to offer the business to his cousins Richard and David Odell. In Stony Stratford Leo Odell was very well known in the area. The seventh child of James and Ellen, he was born in 1877 and lived until he was 77. He will be remembered for his leather gaiters and breeches and was regularly seen in his pony and trap delivering paraffin to cottages around the area to as far as Roade in Northamptonshire. When Leo died his twin sons Lionel and Ronald with their sister Audrey ran the business. Then Richard and David took over with Audrey’s help. 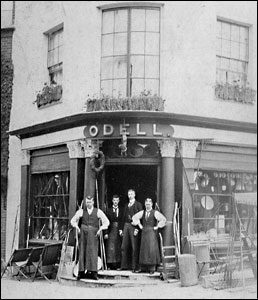 Though Odells in Newport Pagnell closed in December 1991, the shop in Stony Stratford continues to this day.